When six of India’s top scientific academies were asked by Union Minister for Environment and Forests Jairam Ramesh in March to assess the feasibility and safety of genetically modified (GM) crops and their regulation, it was expected their evaluation would help resolve the highly contentious question of growing GM food crops in the country. 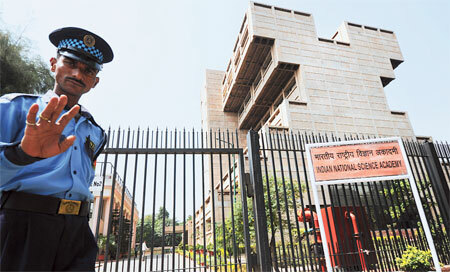 Instead, their report released September end has turned into a scandal for Indian science. For starters, the Inter-Academy Report on GM Crops has no references or attributions—not a single citation. It makes sweeping statements, unsubstantiated claims and has lifted passages wholesale from a government newsletter. And for good measure, it puts forward the view of the global biotech industry as its own. Although everyone from Ramesh to assorted scientists has trashed the report, the cream of Indian science, represented by the country’s apex organisations—Indian Academy of Sciences, Indian National Academy of Engineering, Indian National Science Academy (INSA), National Academy of Agricultural Sciences, National Academy of Medical Sciences (NAMS) and National Academy of Sciences (India)— remains unfazed. Their recommendations will not change, say the academies. Here is the crux of the recommendations: “The issue of Bt brinjal deserves special attention… The overwhelming view is that the Bt brinjal is safe for human consumption and that its environmental effects are negligible.” This is in direct conflict with a just released report on the same Bt brinjal EE-1 Event by David Andow, one of the best known experts on the environmental safety of GM crops. His report—Bt Brinjal: The scope and adequacy of the GEAC enviro nmental risk assessment—is a clear ind ictment of the Indian regulator. Most of the major adverse effects of this GM crop on biodiversity and ecosystems have not been evaluated sufficiently, he said. Andow is with the department of entomology, University of Minnesota, US, and his 63-page report (crammed with eight pages of references) demolishes the arguments put forward by GEAC (Genetic Engineering Approvals Com mittee) and its Expert Committee II (see: Holes in risk analysis of Bt brinjal). In fact, the US entomologist warns that the EE-1 Bt brinjal is unlikely to fit into India’s scenario of resource-poor small farmers and may be more suitable for large-scale commercial production. The report of the academies, which ignores the mass of scientific literature on the risks of GM cro ps, has fuelled the Bt brinjal controversy further. Approval for the commercial release of Bt brinjal in 2009 had led to countrywide protests and charges that the regulatory authorities, along with certain politicians, were in bed with the biotech industry. Following public consultations, Ramesh had, in February this year, announced an indefinite moratorium on Bt brinjal. A month later, he asked the academies to give a report on the use of biotechnology in food crops. This was necessary because of the far-from-transparent working of the regulatory bodies, specially GEAC, which had approved Bt brinjal. The GM vegetable has been developed by the Jalnabased Mahyco, a leading seed company part-owned by the controversial global biotech giant, Monsanto. In many instances there was conflict of interest among the GEAC members. This led to pointed questions about the impartiality of the scientific establishment. Far from clearing the air, the Inter- Academy report has only confirmed such suspicions by liberally lifting passages— without attribution—from industry-sponsored documents and citing the conclusions offered by these lobbies to recommend lifting the moratorium on Bt brinjal. It has in the process shown Indian science in poor light and highlighted the lack of transparency in the way academies function. It transpires that the academies held just one meeting, on June 1, before the report was compiled. In their own words it was “a brain storming meeting which was attended by a cross section of Fellows and nominees of the Academies”. The report does not list who was present but says the document is based on “a few introductory presentations”, the written comments by Fellows “and the documents brought to the attention of the meeting by different Fellows.” According to one insider, it was a meeting “where the decision had already been taken to push the case of Bt brinjal”. It is not as if there was no dissent. Some half a dozen scientists did raise concerns about safety and environment impact of GM crops but they were outnumbered by the pro-GM lobby of around 50 scientists. Papers that highlighted risks, such as the one on “the dangers of uncontrolled, random insertion of the transgene and the unsatisfactory, inappropriate and highly inadequate biosafety tests” by an eminent scientist, were not considered at all, said a participant. How badly does it reflect on Indian science? “The integrity of scientific studies in India is not uniformly good or bad; it varies. 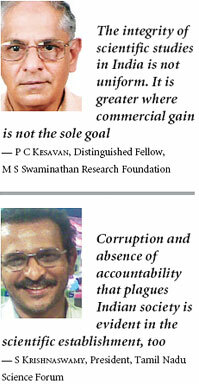 There is greater integrity where commercial gain is not the sole goal,” emphasised P C Kesavan, distinguished fellow of the M S Swaminathan Research Foundation in Chennai. That might explain why the report did a cut-and-paste exercise instead of holding wider consultations to arrive at a more honest formulation of the conclusions. Among the passages it lifted is the following: “Bt brinjal Event EE-1 has been subjected to a rigorous biosafety regulatory pro cess enco mpassing all aspects of toxicity, allergenicity, environmental safety, socio-economic assessment, etc.” This was ta ken from an article by P Anand Kumar, director of the National Research Cen tre for Plant Biology and member of GEAC, which approved Mahyco’s Bt brinjal. The plagiarisation was spotted by the Coalition for GM Free India, a collective of activists, which is outraged that a GM plant breeder’s views have been used to justify the lifting of the moratorium. What is wor se is that critical parts of Kumar’s article in the Department of Biotechnology’s journal Biotech News are themselves a straight lift from a report prepared by the International Service for the Acqui sition of Agri-biotech Appli cations (ISAAA), the lobbying organisation for the biotech industry that is funded among others by Monsanto and Mahyco. In any case, the strong nexus between India’s regulatory bodies and the global industry is hardly hidden. At one time, C D Mayee, the co-chair of GEAC, was also a member of the board of ISAAA. Even Prithviraj Chavan, science and technology minister, has been quoting from ISAAA documents to push GM crops. So how is it that the inter-academy report and Andow take such diametrically opposed views? “Even a cursory reading shows it is slanted to placate the funding agencies and the multinational lobbies,” said Krishnaswamy. For Kesavan, the troubling question is the haste with which Bt-brinjal is being pushed into the market without knowing for certain the genetic toxicological consequences, if any. Kesavan, who has had stints at the Bhabha Atomic Research Centre (BARC) and Jawaharlal Nehru University (JNU), recalled that it took 16 years for irradiated wheat to get safety clearance. It is an example worth recounting in this context. In 1972, BARC had sought permission from the health ministry to trade in the irradiated food items after elaborate safety evaluation using the most appropriate genetic toxicological tests. It was then that the National Institute of Nutrition (NIN), Hyderabad, produced data claiming that irradiated wheat induces dominant lethal mutations and chromosomal aberrations in the cells of mice, rat, monkeys and malnourished children fed with such grain. Following this, the ministry app ointed a two-man committee of Kesa van, who was then dean of the School of Life Sciences at JNU, and P V Sukhatme to evaluate the studies of NIN and BARC. Kesavan, with two of his students, rescored the NIN and BARC slides and submitted a report that irradiated wheat was safe for human consumption. The tests were repeated by two international agencies and it was only in 1986 that the Food and Drugs Administration of the US gave clearance for irradiated wheat. Yet, the approval for trade in irradiated food was given by the Indian government only in June 1994 when Kesavan was the director of Bio-Medical Group of BARC. “So, my question is why such haste with Bt brinjal?” he asked. As Sujatha Byravan, a molecular biologist in Chennai, sees it, the academies have dealt with critical issues—those related to yield, environmental safety and health—in a superficial way. “This is dangerous in a country with diverse socio-economic factors. India is very different from the US or Argentina,” warned Byravan, who was till recently the president of the Council for Responsible Genetics in the US. So what should have been a careful scientific study ends up being a political document—a shoddy one at that, according to the US-educated scientist. “In this case it looks like they created a bottom line with which everyone had to agree.” That appears to be a widespread perception. “Undemocratic and socially and intellectually sterile,” is how Pushpa M Bhargava, former director of the Centre for Cellular and Molecular Biology in Hyde rabad, described the academies. He said the report—“a product of massive intellectual corruption, where scientists have knowingly and deliberately compromised their academic integrity”—vindicates his decision in January 1994 to resign from the fellowship of three of the academies. India’s scientific reputation might take a while to recover from this blot. After reading the first few lines its ample clear to me that the people sitting on all those institutions and research bodies are on the payroll of the MNC's,namely Monsanto.As for monsanto,just a random search on google with the keywords 'monsanto fraud' should dispel all remaining doubts about the whole process. The article is inherently biased, which is less than what is expected of one of our best journals and journalists. Why are there no inputs from scientists on the other side? How can a common citizen get a balanced view if a reputed journalists like yours presents only one side of the picture, not unlike what the Academies have been accused of doing? "The overwhelming view is that the Bt brinjal is safe for human consumption and that its environmental effects are negligible.Ã”Ã‡Ã˜ This viewindicates the high level of ecological illitercy among the experts of the academies and naturally it is bound to be in direct conflict with the latest scientific report on the same Bt brinjal EE-1 Event by David Andow,who is one of the best known experts on the environmental safety of GM crops.. Given the poupation of our country, I think adopting GMO crops is the way to go as long as it has been proven to be safe for consumption. Our current path leads to more hunger and higher costs of living. I agree with your points that we need adequate research that has reasonable basis and can support evidence but taking a one sided view(which I think a lot of people in this thread have) is not fair.